Overcast with showers at times. Low 43F. Winds WSW at 10 to 15 mph. Chance of rain 60%..
Overcast with showers at times. Low 43F. Winds WSW at 10 to 15 mph. Chance of rain 60%. 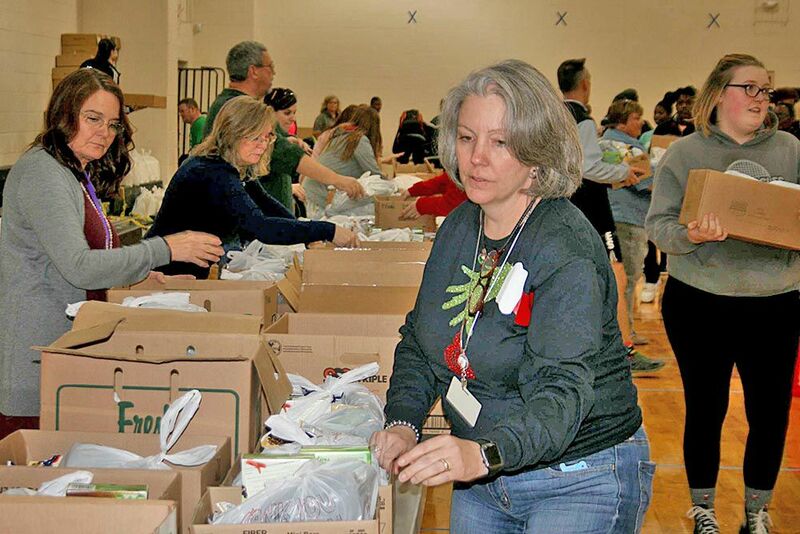 On the second Wednesday of every month Floyd County Schools hosts a Pop-up Food Market at one of their high schools, giving away 10,000 pounds of food items to community members who need it. “No one is turned away,” Donna Carver, child nutrition director, said. The program is made possible by a partnership with the Atlanta Community Food Bank who provides all of the food, Carver said. Each family received one to two boxes of food based on their income level, which contained perishable and non-perishable items. 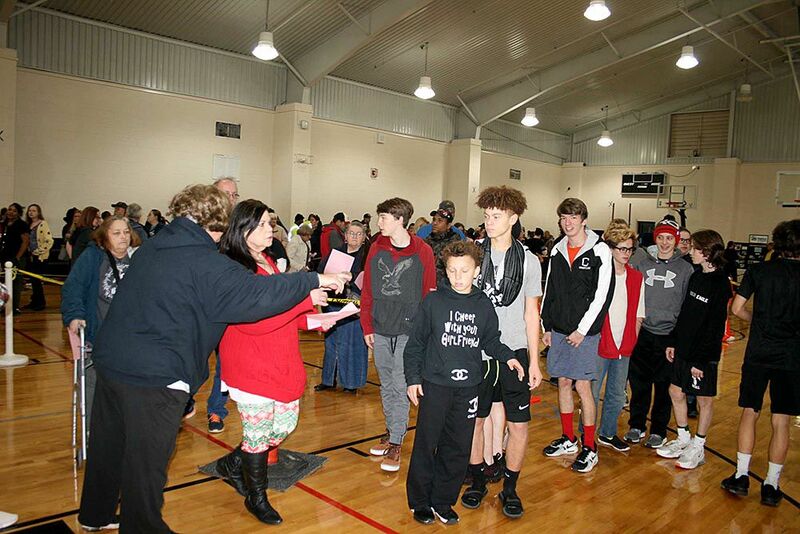 Families and community members lined up in the Coosa High School Auxiliary Gym Wednesday night to pick up their boxes containing milk, eggs, cheese, beans, deli ham, bakery goods and more depending on which box they received. Coosa High School students were on hand to help carry the boxes to the participant’s cars. While working a registration table, La Donna Turrentine, principal of Coosa High School, said she was happy at the turnout of Coosa students who were volunteering. She said it was good to see how well her students worked together, especially those who don’t normally come into contact with each other on a school day. The program came to Floyd County when members of ACFB approached Carver about a breakfast grant. The program, called the Mobile Food Pantry in Atlanta, was mentioned and Carver loved the idea. She said the representatives from the food bank were hesitant at first because the program had not been outside of Atlanta. “We can do that,” Carver told them, and now she said Floyd County Schools does this program bigger than anyone in the Metro-Atlanta area. The food comes from the ACFB and is stored at the Bagwell Food Pantry at Action Ministries. From there it is brought to one of the Floyd County High Schools by rollback truck courtesy of Harry’s Wrecker Services, and is unloaded by United Rentals using a forklift. The entire procedure costs the school system nothing and everything gets put into the community. “Any time you can bring something into the community it’s a win,” Carver said. There are families in the Floyd County community that struggle she added. It’s easier for students to succeed when they are not thinking about where their next meal is coming from. Information for the event is spread through social media and each Pop-up Food Market serves from 400-420 families. December’s pop-up market was the fourth the county school system has hosted with the first being at Pepperell High School in September, which saw over 700 families. Carver said that has been the only time they have run out of food. The numbers have decreased since the first experience, however there has always been just enough food to send home with everyone. The Pop-up Food Market is the same program as the ACFB’s Mobile Food Pantries, but the name was changed to take away stigma, said Carver. Pop-up Food Market makes it sound more inviting to community members. The next Pop-up Food Market will take place on Jan. 9 at Pepperell High School.